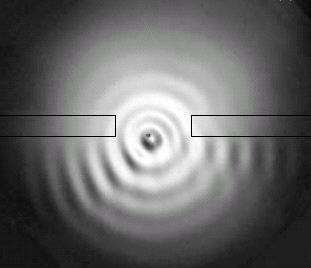 This photo shows the droplet bouncing through one slit, while its trajectory is deflected by the interference of the reflected waves from two slits. With a variation on the famous double-slit experiment of quantum mechanics, scientists Yves Couder and Emmanuel Fort from the University of Paris 7 are rewriting the textbooks. Their accomplishment, however, has less to do with quantum mechanics than with an observation once considered experimentally impossible: the wave-particle double nature of a macroscopic object (an oil droplet and its associated surface wave). The droplet, which is about 1mm (10 million times larger than an atom), is also one million times larger than the second largest object--a 2-nm molecule called a buckyball--whose wave-particle duality was observed in 2003. Although there is no specific dividing line between the quantum and macroscopic scales, an object larger than an atom generally has much too small a wavelength to be detected. Wave-particle duality, one disturbing chapter of quantum mechanics, means that all objects (quantum and macroscopic) sometimes behave like waves and show interference, and other times like particles--objects that have mass and obey conservation laws. Duality, though strange, could explain why objects seem to be in two places at the same time and communicate instantaneously across distances. These abilities, to scientists, would be even more difficult to reckon with than wave-particle duality, which is accepted as an "interpretation" of the world rather than a literal description. This graph shows the deviation of the walker´s trajectory, even with the same initial conditions. The deviations are due to wave interference. Couder and Fort have recently designed an experiment that enabled them to detect the interference pattern of an object they call a "walker"--a droplet of silicon oil and the surface wave packet it emits, which should be thought of as one entity. The scientists forced the droplet to bounce indefinitely on the surface of a vibrating fluid. At a certain instability threshold, the droplet emits a wave packet which in turn makes the droplet "walk" on the liquid surface. To detect the walker's interference with itself, Couder and Fort glued three thick strips to the bottom of a cell placed in a tank, reducing the depth of the liquid above the strips. The intervals between two strips acted as a diffracting slit, much like the slits in the original double-slit experiment. The scientists observed that the wave emitted by the droplet "interfered with its own reflections," and that the droplet's normally straight trajectory deviated when passing through the slit. The remarkable feature was that even with identical initial conditions, the deviation of a given individual walker appeared random, while the deviation of many walkers revealed an interference pattern. "There is a mysterious aspect to the single particle interference experiments in quantum mechanics,” Couder said. “When you have two slits, a single particle passes through one or the other (as checked experimentally by Grangier and Aspect). But interference patterns can also be observed as if each single particle had passed through both slits. In quantum mechanics, both measurements cannot be performed simultaneously. If one measures through which slit the particle passes, no interference is observed. But if one observes the interference, then everything is as if the particle had passed through both slits. These results are entirely predicted in the formalism of theoretical quantum mechanics, even though it is difficult to get an intuition for them. While the scientists observed that each droplet goes through only one slit, the associated wave travels through both slits, with the wave interferences determining the walker’s trajectory. 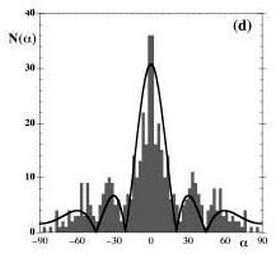 When creating a histogram based on the walkers’ deviations, the scientists found that the graph highly resembled that of a plane wave. In other words, this interference of the waves generated both individual uncertainty and statistical determinism in the trajectories of the material particles formed by the drops. Citation: Couder, Yves and Fort, Emmanuel. "Single-particle diffraction and interference at a macroscopic scale." Physical Review Letters. Upcoming article.